In my collection of childcare supplies I have dozens of puzzles. Some of them belonged to my own children when they were young, others have been purchased or donated to my childcare program. 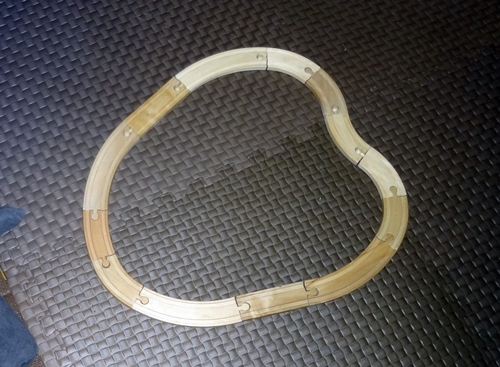 There are some very simple puzzles with only a few pieces, some with up to 1000 pieces, and everything in between. Puzzles have always been available as a quiet time activity but they have never been a favourite choice for any of the school-age children. Occasionally the older children would choose a few of the simplest puzzles and have competitions to see who could complete them the fastest – this tended to be too loud for quiet time. The larger, more complicated puzzles were never popular and simply gathered dust. In the past I’ve wondered if the children found these larger puzzles to be too time consuming to be completed in one sitting. When I have had several older children in attendance for longer periods of time during school breaks I have set up a puzzle area where they could work on a puzzle project independently or with others. There was no need to put it away when they tired of working on it and so it could be completed over several days. Still, no interest. My current group of preschoolers might change that. For these little ones puzzles are one of their favourite activities. They have done all the smaller puzzles many, many times. They can easily complete several puzzles in one sitting and often have many puzzles out at once because they finish them so quickly. They never seem to get tired of doing puzzles. None of the preschool puzzles offer much a a challenge to these three and four year old children any more so we now work on the 100 piece puzzles. What I find most interesting is that they also ask if they can do these puzzles ‘together’. Cooperating on any activity is a challenge for these little ones so of course I’m going to facilitate any request like this. There are so many learning opportunities throughout this one activity! Even when they are busy doing other activities they often talk about doing puzzles together – planning or reminiscing. Start to finish these two can complete a puzzle this size in about 30 minutes. I have several types of construction toys which are never all out because there is not enough space and too many toys is overwhelming. The various construction sets are placed in the block area bins as one complete set or a combination of two or more partial sets. Selecting the set(s) to have available is dependent on the interests and ages of the children enrolled at the time. 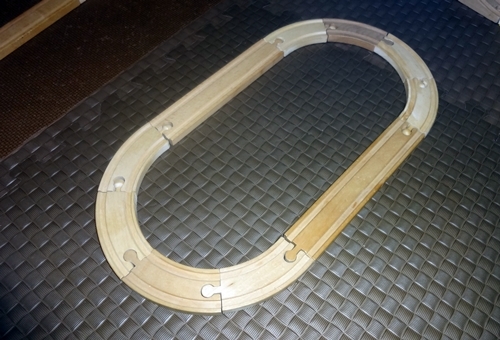 The train tracks are one of the construction sets that sometimes cause issues in a mixed age group. 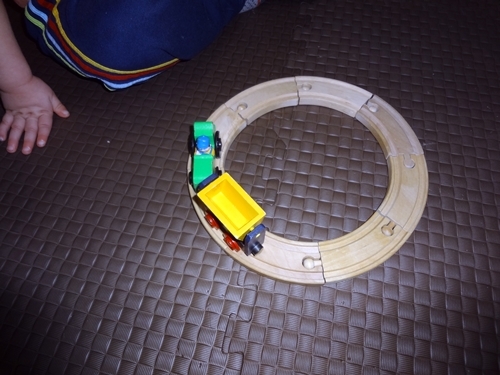 Some children enjoy building large elaborate track systems but this requires cooperation if there are several children involved. 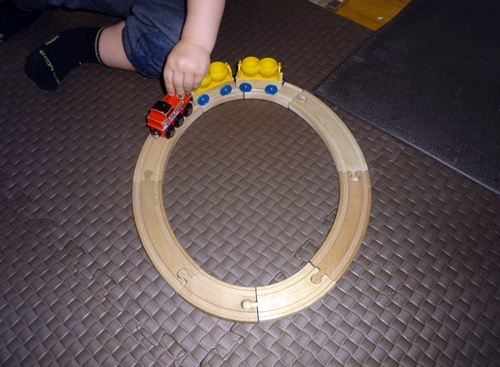 When infants and toddlers are present this is not always possible and many young children find building with the train tracks to be frustrating. My current group of infants and toddlers may be the exception. 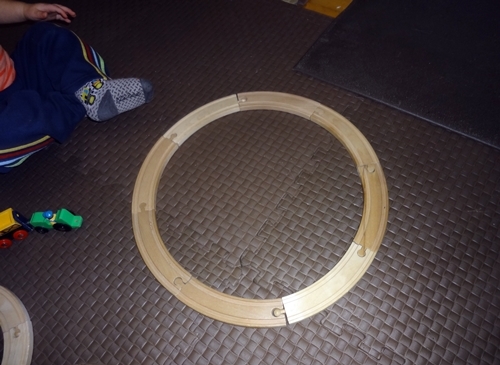 The train tracks have been available in the block area for almost three months now and the children are showing no signs of getting tired of playing with them. I have changed the other items in the block bins several times since the tracks were introduced – now we have the stacking cups – but the train tracks remain. Curve, turn, flip, and direction were some of the words we used often during the process. 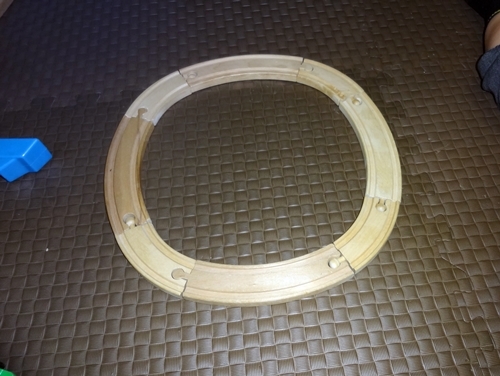 For a couple weeks they were content with these two designs and became experts at building them without assistance. Then I suggested we change things a bit and use both types of curves – four small and four large – still eight pieces but arranged in pairs first. With this group of toddlers the train tracks may be out for a while yet – they are still showing no signs of getting tired of building train tracks. In fact, the two year old was super excited to build and name this ‘heart’ all by himself. At one time the school age children I had in care became obsessed with llamas. Originally I think they just liked the way the word “llama” sounded and they liked to say it over and over. We started collecting pictures of llamas to display around the house. The children searched the internet and books for information on llamas – where they came from, what they eat, and how to care for them. They found sites where you could purchase llamas and decided they wanted a llama for a pet. When I pointed out that we couldn’t keep a llama in the city they wanted to know “why” and set out to find the answer. They used their new found knowledge and imaginations to write stories about and build models of “Llamaland”. They played indoor & outdoor llama games like “Llamas From Space” and “Spy Llama”. The preschool children never really caught on to the llama thing but because one of our llama poems included other animals too, the younger children developed an interest in rabbits. We read rabbit books and made rabbit crafts. I set out pop-up houses and tunnels and they spent hours every day hopping about building burrows and dens. They all became carrot lovers — kids may hate vegetables but rabbits love them! The llama obsession lasted about two months – I call it an obsession because during that time my school-age children had ZERO other interests. Some of the parents lamented “When will this llama thing end?” Listening to the never-ending Llama Song may not or may not have helped depending on which side of the llama fence you were on. The llama obsession did eventually end but this particular group of children (and I) continued to love llamas. Years later there was a brief llama resurgence when a new group of children discovered the llama books by Anna Dewdney. However, this group of children didn’t have much interest in llamas beyond the books. I still find llamas fascinating and continue to seek out llama stuff. I was thrilled to discover that Folkmanis had alpaca puppets – they may consider them to be alpacas but for us they are llamas because alpaca is not nearly as fun to say. 🙂 I have bought both the stage puppet (this one does look more like an alpaca) and the hand puppet (definitely a llama). The children have named the hand puppet ‘Mortimer’ but rarely use his name because ‘llama’ is so much more fun to say. The stage puppet is larger so therefore always just gets called ‘Mama llama’. Once, just once, I played the Llama Song video while the children were waiting for lunch to get dished up. Yes, I can see that becoming an addiction very quickly with this group too. I think we’ll stick to the puppets and books instead. Even the youngest children quickly learn where their favourite toys are located in the playroom. If they need a tool they head over to the workshop area. When they want to join the others in a song they know where to look to see which musical instruments are available. They know which shelf in the housekeeping area has the plates and bowls and which bin has the fruit. The fact that I organize the play food according to food groups is a playful learning opportunity. The main reason I like to organize the shelves is so a quick scan of an shelf will reveal if all the toys are accounted for or if one is missing. If one is missing we can look for it right away – the less time it has been missing the more likely we are to easily find it. This is especially important for the toddlers in particular. Many of the toddlers have favorite toys that they like to carry at all times. The pink ice cream cone, the rice bag, and the stuffed unicorn are the current favorites – if one of them is missing there will be meltdowns if we don’t find it. Sadly some of the older children seem to find it amusing to occasionally hide these toys and ‘watch the show’. Grrr. It is rare that a toy is missing and cannot be found but occasionally it does happen. The little stuffed swan from the Ikea farm has been missing for months. I have an idea which four legged, stuffed toy loving, feline may have absconded with that particular item during a nocturnal hunting expedition. Taken beyond the confines of the playroom there is little chance we will ever find it. One mysterious disappearance that baffles me is the plastic heart shaped container. It was the beginning of February that I put two of these containers in the playroom. By 7:15 Monday morning one of the containers was missing – two lids and one container were in plain sight near the shelf where they belong but the second container was gone. Sometimes I feel like I should be writing more posts. I reflect on why I haven’t been writing. Have I been too busy? It doesn’t always take long to write a post but if I haven’t got a solid hour of time to commit to it I usually don’t start. Lack of inspiration? There is always some type of activity or a change that I have made to our play space but sometimes I hesitate to write about it – again. Maybe I’ve written about a similar activity with a different group of children. Also, I make so many changes to our environment sometimes I wonder if readers get tired of hearing about them all. Mostly, I think it is a matter of ‘not enough’ for a full post. A cute story, exciting activity or pictures for which the description is just missing something. Sometimes I just can’t explain in a post what was going on and why I thought it was interesting. I was doing some Christmas shopping at Costco when I saw them – ponies! 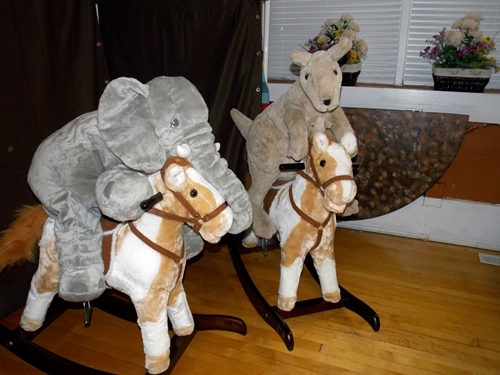 Actually, the label says ‘rocking horse’ but I like to call them ponies – I bought two. They were not on my shopping list but I couldn’t resist – they were only $20 each! Now I will admit they ticked a few boxes on my ‘I don’t like’ list. They were fairly large toys and I have a limited amount of space. They have batteries and make noise. I prefer ‘use your imagination’ toys over ’cause and effect’ toys. They have some limitation for age/size of children which may cause frustration for the children and me. I had to put stops on them so they wouldn’t rock. I know, some of you are thinking ‘Why do you want rocking horses that don’t rock?’ The answer to that is fairly simple, hence the name change – I wanted ‘ponies’ not ‘rocking horses’. After my ‘Ooooh, they’re so cute!’ reaction my next thought was how many little toes would be squished under the moving base. So on Monday the children got to meet our new, non-rocking ponies. The early arrivals were thrilled. After nearly an hour of pony play they still hadn’t yet discovered the sound/action buttons – so I showed them. When you squeeze the pony’s ear you hear neighs and galloping hooves and the pony’s mouth opens and closes and his tail wags. The children each tried the button once and then went back to their original – before my interruption – quiet pony play. The third child to arrive was also more interested in the ponies than the pony noise/action. It was a different story once children four and five arrived. These two refuse to allow the ponies to be silent – ever! Even when they are not playing with the ponies, if the noise stops they drop whatever they are playing with and run over to press the button again. For me, this is the biggest problem with the battery operated aspect of these and other similar toys. 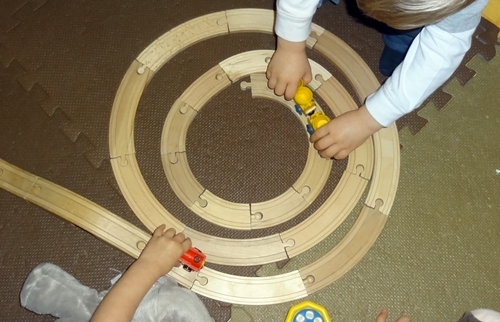 They don’t enhance the play value of the toy – they prevent the children from fully engaging in play. They are a distraction. Sure, the children could pretend to feed the ponies even if the pony’s mouth didn’t open and close but there is an incredible amount of cooperation and problem solving as the children work together to find items that fit in the pony’s mouth and stay there as he ‘chews’. The saddle stirrups have caused some problems – rider’s feet sometimes get stuck in them making a safe dismount difficult. I’ve tucked the stirrups up under the saddle but I’ll probably end up cutting them off completely. On a weekend shopping trip in early October my husband and I had stopped in at the Dollar Tree to pick up a few items. The store had many Halloween themed displays and as we perused the aisles we often heard the mice. 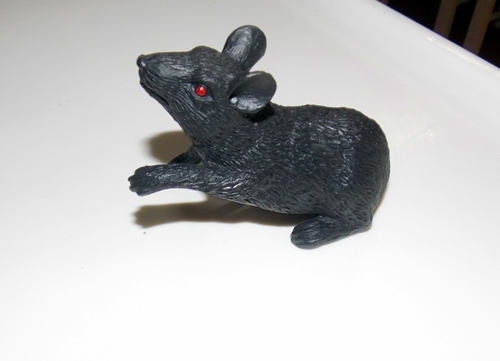 Not real mice – these were small, motion activated decorations. The store staff had placed several of them on shelves throughout the store. As customers walked past they would trigger the mouse squeaks. I am easily amused by things like this so of course I wanted one. Hubby and I thought our cats at home might be tormented like these mice. We picked up one of the packaged ones from the bin by the checkout. Back at home I unwrapped the mouse and pulled the little tab from the battery compartment. No squeaking. My son and I took turns trying to get the mouse to make noise. We could see the motion sensor but no matter what we tried we couldn’t get it to work. We decided to take it apart – maybe the battery wasn’t connecting properly. Once the mechanism was removed from the mouse body it worked fine. We put it back in the mouse and again could not trigger the sensor. Defective dollar store mouse. Having already wasted enough time trying to get the thing to work I gave up and left it sitting on the counter. Later that evening, when we were sitting in the living room, the mouse on the kitchen counter began to squeak. No one was in the kitchen – there had been no movement. Possessed dollar store mouse. Over the next few weeks the mouse sat on the kitchen counter and continued to squeak randomly. Sometimes it would go for several days without making any noise. Then one day it would squeak on and off throughout the morning or afternoon and then go silent again. I’ll admit that it was a little eerie to hear the mouse at night when we were all in bed and the house was dark. During the day it made me smile when I heard it initiate a conversation – yes, I do often talk to the mouse. I know, it may not be ‘normal’ but our conversations are often more sensible than some of the conversations I’ve had with toddlers. Last week the mouse was very vocal. Sometimes it was very irritating, squeaking almost constantly for several minutes at a time with only brief periods of silence in between outbursts. I tried moving it to other locations in the kitchen – behind the toaster, in the dark corner beside the fridge, under a towel or even in the bread bin. Still it continued to squeak and ignore my requests that to be quiet. Annoying dollar store mouse. It now sits on the plant shelf above the toddler table. It seems happy there, not complaining as much, back to the occasional squeaking. The toddlers never seemed to notice when it squeaked in the kitchen. They notice it now – especially at meal times when it interrupts their conversation. After the mouse squeaks there is always a brief period of silence as the toddlers sit still and stare at each other.